The new heads of Christopher Street West today laid out a goal for expanding the non-profit’s activities and making the annual LA Pride Festival more inclusionary at a forum that became contentious when those attending found they were unable to voice their opinions. Many of the approximately 45 people in attendance assumed it would be a town-hall style format where people would be allowed to talk about what they loved about the Pride events as well as voice their concern over how CSW has handled the LGBT Pride festivities in recent years. However, no one attending was given a microphone or invited to speak. Instead, attendees were instructed to write their questions and comments on note cards, and the forum moderator, West Hollywood City Councilmember Lindsey Horvath, then asked those questions of the CSW leaders. While that format got a lot of information out, by the time the 90-minute forum ended, frustrations were running high that people had listened patiently but never gotten a chance to speak their mind. Consequently, longtime WeHo resident Dan Morin, who briefly served on the CSW board in 2016, stood up and shouted about his outrage. Others shared Morin’s dissatisfaction, with WEHOville overhearing several people saying things like, “They’re not really interested in what we think,” or “Same old, same old.” Montemayor said that he would meet with Morin to discuss his concerns. Horvath told WEHOville that she never intended the gathering to be a community therapy session for people to air grievances about the past, but rather a chance to look to the future and meet new CSW Executive Director Madonna Cacciatore (the group’s first paid employee) and new CSW board President Estevan Montemayor. Although promotional information for the event billed it merely as a “community forum,” many attendees WEHOville chatted with afterwards said they arrived assuming they would get a chance at the microphone. Cacciatore and Montemayor are currently conducting a “listening tour,” meeting with individuals and small groups to hear their concerns about LA Pride and what it’s lacking. Some people may have assumed this forum would be a larger version of that listening tour. 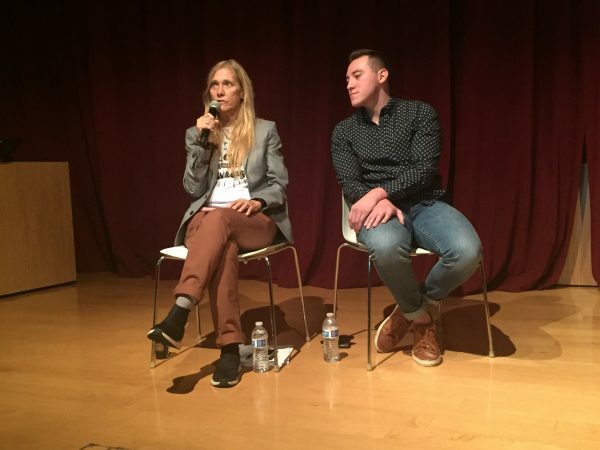 The last community forum regarding CSW, held in August 2016, was indeed a gripe session where people offered specific (and often angry) feedback about feeling excluded from that year’s LA Pride festivities, which was organized as more of a gay music festival aimed at millennials. Perhaps people thought this forum would be a repeat of that 2016 one. Whichever the case, Montemayor remarked to WEHOville that Pride means many different things to many different people. People are passionate about their Pride experience, which often results in sharp criticism when Pride, or even a forum to discuss Pride, does not live up to expectations. LA Pride intends to stay in West Hollywood, at least for the foreseeable future. Construction in West Hollywood Park has limited the “footprint” of the festival grounds by about 50%, but Cacciatore reported she is working closely with city staffers to figure out the best use of the available space until construction is completed in 2020. Because of that park construction, the city arranged in 2017 and again in 2018 to include the plaza at the Pacific Design Center as part of the festival grounds. Montemayor said they hope to continue to use the PDC plaza even after park construction is completed, provided the rental cost isn’t too high. Cacciatore reported that CSW and city officials are discussing closing off Santa Monica Boulevard in the Boystown area for the entire Pride weekend, or at least on Pride Sunday, and holding a block party type event, just outside the festival grounds. She also said that closing off Robertson Boulevard was another consideration, but noted that might feel like a completely separate event, especially since there is not currently direct access to the park from Robertson due to the construction closures. When asked about eliminating the admission fee to the festival ($25 in advance, $30 at the gate in 2018) and making admission to the festival free, Cacciatore, who has previously worked as an events manager for the LA LGBT Center and AIDS Project Los Angeles (APLA), explained that the costs of putting on the festival and related security keep rising. She noted fewer and fewer cities are having free pride festivals these days. Cacciatore said that each year CSW gives 1,500 tickets to various area LGBT groups/organizations that distribute those tickets to low-income people. In addition, people who volunteer to work the festival are welcome to stay on the grounds after their shift is over. For several years, CSW opened the festival grounds on Friday nights and had free admission. That “Free Friday” was eliminated in 2017 after CSW had budget problems, but many would like to see it return. Cacciatore said they are considering it, but the cost may be prohibitive. Cacciatore reminded everyone of the importance of Pride, pointing out that many people come out at Pride, finally admitting to themselves and/or others that they are LGBT. She noted Pride provides a safe environment where people may be seeing others who are uninhibited about their sexuality for the first time. Montemayor reported he had an hour-long meeting with the Rev. Troy Perry to get his blessing as the new board president, a rite of passage every CSW board president apparently goes through. Perry and the Rev. Bob Humphries (founder of the United States Mission) and Morris Kight (a founder of the Gay Liberation Front) created CSW and, with the help of the ACLU, sued the Los Angeles Police Department for the required permits to hold the world’s first gay pride parade in 1970, on Hollywood Boulevard. Cacciatore promises that under her leadership, LGBT history such as that battle Perry fought will be honored and included in Pride festivities. “We have a great generation coming up, and I want them to understand what we went through to get here,” said Cacciatore. As part of honoring history, she hopes to also have different lounge areas at the festival, recreating the Stonewall Inn, the Black Cat bar and the Palms bar, so people can understand the LGBT history that happened in those places. Beyond the Pride festivities held in June, CSW hopes to put on Pride-related events throughout the year, part of a plan it calls “Pride 365.” That plan would include holding LGBT-related events and activates connected to Latino Heritage Month, Women’s History Month, African-American History Month, etc. Similarly, Cacciatore dreams of creating an LGBT Arts Festival for LGBT youth and seniors, plus more LGBT family events. “My goal is to hire a development team that would focus on creating programs and services for our community, creating other events for our community to come together outside of the festival, so that it feels like we’re a part of your life, not just once a year, [but] all year round,” Cacciatore said. Likewise, CSW plans to continue sponsoring an LGBT Night at Dodger Stadium as part of the events leading up to Pride weekend. Montemayor explained they are trying to do a diverse range of things to attract different audiences. “Some people may not be interested in the Pride Festival, but they like baseball, so they might come to our LGBT Night at Dodger Stadium,” he said. CSW is also doing an LGBT Night at Universal Studios theme park, and one at an LA Sparks WNBA basketball game. Expect CSW to partner with other area groups to have more such LGBT Nights. Cacciatore hopes to put out a quarterly newsletter keeping people abreast of what CSW is doing. Finally, look for CSW to create a citizen’s advisory board to provide guidance as CSW continues to expand its mission beyond the event on the second weekend in June. People interested in applying for membership to that citizen’s advisory board should contact the CSW office, whose contact information can be found online. Pride has become a gay holiday celebrated around the world each year in June. We just need a parade and a somewhere to hang for a few hours. A place where we can meet up with old friends or make some new ones. Grab a bite to eat. A couple of headliners singing on the main stage would be nice. Holding a CicLAvia type event where people could take their bikes on the subway to Hollywood and Highland and then ride them to the festival would be icing on the cake. I confused about solving 50 years of angst comment. Most people were just upset about last year when as a group…Tens of thousands of dollars were spent to on tickets and other expenses to attend a festival that would not let them in. Montemayor success in accomplishing this goal. As West Hollywood’s most experienced LGBT-affirmative licensed psychotherapist, I take issue with Horvath’s sarcastic characterization that the forum was not intended to be “group therapy session” for airing grievances. I think that remark demeans the professional service of group therapy in particular and the delivery of mental health services in general. To use the term “therapy” in this demeaning and sarcastic way devalues the service and is an insult to professional providers and the consumers of those services. It also invalidates the needs of the citizens of the community to have the dignity of having their grievances heard by those in Power, and not just heard, but with a reasonable expectation that the complaints of tax-paying citizens of the City of West Hollywood will be taken seriously by making changes to keep our officials accountable to The People. I think Horvath owes an apology to all concerned. How does this group maintain a monopoly on LA Pride? Even when the park is done, there will not be enough space. SF has their FREE festival (or minimum donation) in their civic area. Move the LA pride festival to DTLA with a new organization running it. Keep the parade and a small event on Sunday in West Hollywood. The Council will NEVER let LA Pride leave WeHo because it generates so much money. But LA Pride could not exist without the largess of the City (fee waivers, street closures, etc., etc., etc.). But what really distresses me is that after almost 50 years, CSW (LA Pride) has had a host of continuing problems. Why can’t they get their act together? Agreed. The won’t, and shouldn’t leave the City of West Hollywood. The city donates generously with the waiving of fees, and West Hollywood is still the epicenter of LGBTQ life in Los Angeles. Not to mention they have their own festival downtown now. I would like to understand, however, how SF can provide a free festival, and how other cities cost far less. I mean, the specifics, in those cities, as to why. I don’t think I’ve ever heard it discussed at any of these meetings. I have never clearly understood, why #Sizzle, a destination sober site inside the festival has been treated like an unwanted child. Rather than support a much needed, extremely organized event in the event, our plea’s for security have fallen on deaf ears. This year, Sizzle was destroyed on Saturday night and had to be put back together on Sunday morning. In the past our DJ’s have had to put up with unwanted touching, with the event planner telling us that he had sections bringing in bigger money that he had to worry about, and Sizzle was not his priority. YES…THAT WAS SAID. With #Sizzle being unanimously supported by council every year, as it is answers to part of the core values of this city, I would think that the volunteers that make this extraordinarily popular feature of Pride would be cared about just a little bit more. Perhaps with new leadership it will be. Although, I do believe that the message should be translated to the event planners themselves. I do miss Ganzel! Inspirational article and Cacciatore’s inviting inclusive uplifting written words sound promising especially for some of us who understand what it can be like to be on non profits serving LGBT and on city festival development producer teams since 1990 with top entertainment and major funding sponsors developed and top media with hundreds of thousands…yet not yet anytging but banned and invisible for years of many of our efforts…she is one we can all get behind and support. This event was promoted as a forum, and by definition a “forum” is a public meeting or lecture involving audience discussion. There was no audience discussion and most of the questions and comments on note cards were ignored. Even though this event started 20 minutes late, and we were ushered out at 11:50, there was still plenty of time to hear from the CSW representatives and then take audience questions and comments. There were only 45 people in attendance. This event could have been the first of their “small group listening tour”……and good practice for the ones to follow.